Clive Hannay is a native of Dorset and he has lived and worked here all his life. He began drawing and painting from the moment he could hold a pencil and brush. Locally educated, he won his first Art competition in Sandford, near Wareham, at the age of nine and sold his first piece of work at the age of 11. He decided to follow his talent and so, during the mid 1980’s he started working for the Dorset Naturalists Trust (Now Dorset Wildlife Trust) as their illustrator. He used his skills with pen and ink to produce a series of leaflets depicting different Nature reserves in the county. 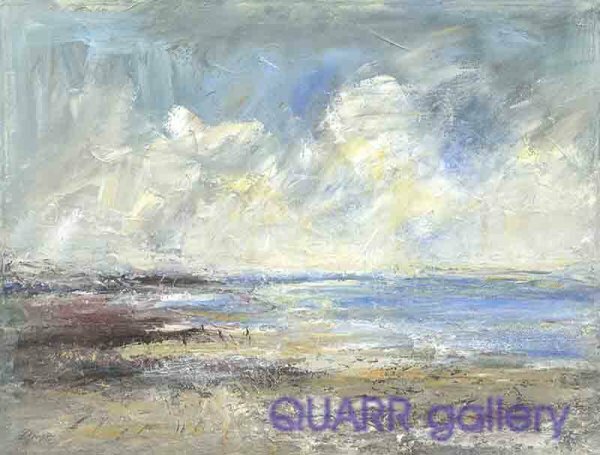 Clive draws his inspiration from the Dorset countryside and coast. His masterly use of colour combined with his superb eye for detail produces paintings of exceptional quality, depth and clarity that capture the peace and serenity of the heart of Dorset. He has exhibited locally for the last 20 years and has had three major one-man exhibitions, which were sell-outs within a few hours. His work is collected avidly and has completed commission for numerous clients including BP, with his work being presented to a member of the Royal family and he has twice been accepted at the Royal watercolour society at the Bankside in London. In addition to the village scenes that appear in Dorset Life Clive has pursued a number of themes that draw on his Dorset surroundings. His latest project depicting a figure in a landscape is an ongoing theme, trying to encapsulate the vast bridging of time between his model and the setting. From time to time we have original paintings from Clive but it is in the nature of work of this quality that there will never be many. However, we offer a range of painstakingly produced high quality limited edition prints that make his work available to a wider public.